Ever watched babies and toddlers reach out to other babies and toddlers? It does not matter if they are poorer or richer, girl or boy, disabled or not, cleaner or dirtier, brown, black, white, yellow, or whatever. Young children have no concept of differences between individuals. It is unfortunate that this utopian state cannot last forever, as children become keenly aware of differences as they grow up, a process of socialization and enculturation. Teaching kids about diversity and the right attitudes towards all of it is the duty of every parent. If everyone did this for a child they are responsible for, it would go a long way towards developing respect for a fellow human being. 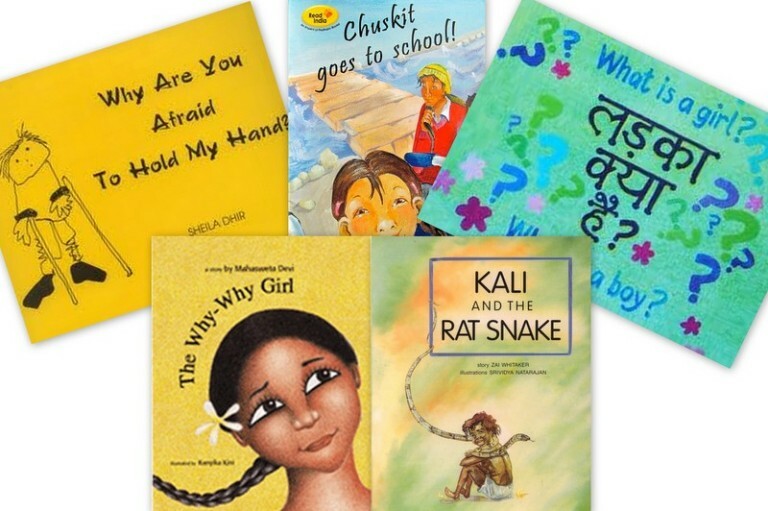 Differences due to gender, caste, appearance, race and socioeconomic status can be very tricky to explain to children, but books can help you out. 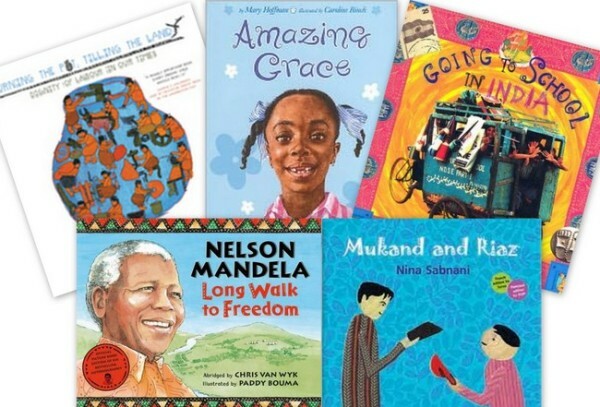 Here is a list of books about diversity for young kids which I have found useful in talking to my daughter about these tricky subjects, most of them in the Indian context. All of these are easily available in stores or directly from the publishers. 1. Why Are You Afraid To Hold My Hand? Written and illustrated by Sheila Dhir. We are uncomfortable around the differently-abled, and often consider them with pity, fear or disgust. But it is imperative that we recognize them as one of us. Inspired by the Spastics Society of India, this little book is a celebration of the normalcy of the differently-abled. It makes the point that yes, there is certainly a problem, but the children in the book just want to be treated like children. Written by Sujatha Padmanabhan. Illustrated by Madhuvanti Anantharajan. Nine year old Chuskit longs to go to school like her brother. It is almost impossible for her in her home town of Ladakh, as she cannot walk, and has to use the wheelchair to go anywhere. How would it be possible for her to cross the rocky, hilly terrain over the river and up the hill to the school? It becomes possible only because her friend Abdul recognises her need, and ropes in the school and all the children to build a levelled road up to the school. A cheerful story about recognising and doing what the society needs to do to make life easier for those differently-abled. 3. What Is A girl? What Is A Boy? Written by Kamla Bhasin. Illustrated by Bindia Thapar. Gender discrimination affects everyone – female and male – by denying them the ability of growing to their full potential as human beings. You read that right, even males lose out by this discrimination. They are strait-jacketed into society’s expectations of male behaviour: denying them their softer, emotional side; anger and aggression being the only emotions that they are permitted to display. Kamla Bhasin works with Jagori, which literally means “Awaken, women!” A book which is as much for parents as for the children, it tackles everyday instances of gender stereotyping in simple terms, with lots of colourful pictures and raises several points for discussion. Written by Mahasweta Devi.Illustrated by Kanyika Kini. Along with gender, there are other things that we discriminate about. Caste and race are some, explored in this book by noted writer-activist, Mahasweta Devi. Children are full of questions about the world they experience, trying to make sense of it. Moyna is one such ten year old. She is a poor, tribal girl, who has to help tend to the goats of the landlords, eat the leftovers they give away, and cannot go to school. Why? She wants to learn and manages to find a way. Written by Zai Whitaker. Illustrated by Srividya Natarajan. On the first day of school, Kali proudly introduces himself in class as belonging to the Irula tribe that catches snakes. That immediately makes him a target of teasing by the other students. For the first time in his life, Kali becomes aware of his being different. He wishes his father does some other ordinary work. To top it all, the teacher praises his work, making the others reject him further. Having no one to call a friend, he starts hating school and all that it represents. Until one day when a rat snake enters the classroom, and Kali does what he knows best. Written by Mary Hoffman. Illustrated by Caroline Binch. Publishers: Francis Lincoln Children’s Books. Grace loved stories. More than that, she loved to act out the stories. And she was very good at that. So when her class was to do the play of Peter Pan, she wanted to do the part of Peter. But Grace kept her hand up. It was a sad little girl who went home. Her grandmother decided to take things in hand, and showed her that she could be anyone she wanted. An amazing little book indeed, with simple text and evocative illustrations. Written and illustrated by Nina Sabnani. Then there is religious discrimination. This is the story of a friendship that goes beyond differing faiths. Set during the partition of India, this is a true story as experienced by the author’s father, Mukand Sabnani. He was a boy then, and Riaz was his closest friend. Until the partition came along, and Mukand’s family, being Hindus, had to flee. At a time when people on both sides were massacring each other, it was Riaz and his family who saw that the Sabnanis got away safely. Abridged by Chris van Wyk. Illustrated by Paddy Bouma. This official picture-book edition of Nelson Mandela’s acclaimed biography in full colour brings to young readers the story of his struggle against apartheid. The story goes from the time when White people first came to Africa, through the life of Mandela as a young Xhosa boy, his education, his life as an adult against apartheid, his struggle for freedom, and his imprisonment, to the time when he was elected as the first President of free South Africa in 1944. This is a book our children can identify with, as Mahatma Gandhi conceived his Civil Disobedience campaign right here in South Africa when he rebelled against the discriminatory laws. Mandela himself was inspired by him. There are many books on Gandhiji that could be explored here, like Picture Gandhi and My Gandhi Scrapbook (Tulika books), A Man Called Bapu (Pratham books) and Mahatma Gandhi: Father Of The Nation (Penguin Books), both by Subhadra Sen Gupta,The Story of Gandhi by CBT and The Mahatma And The Monkeys (Hachette India Children’s Books). Take your pick! Written by Kancha Ilaiah. Illustrated by Durgabai Vyam. A candid and outspoken book about discrimination based on caste, socio-economic class and gender. It speaks about the indigent artisans, farmers, labourers and workers that are a backbone of our society yet are considered lowly and backward. The author speaks eloquently about the necessity of dignity of labour, which alone can take a nation forward. This book is beautifully illustrated in black-and-white Gond art drawings by Durgabai Vyam. Though complex in its reach, the book is lucidly written, and can easily be read/ or read with and understood by 8-12 year olds. Written by Lisa Heydlauff. Illustrated by B.M.Kamath and Nitin Upadhye. This book offers a look at everyday school life of ordinary children in a very diverse India. This is the India we can see in villages and towns, in forests and deserts, on hills and mountains, in swamps and snow, in city slums and tiny hamlets…the diversity is endless. We can read stories of individual children in these places, their dreams, feelings, struggles and privations; all in full colour, full page photographs. Our children can see for themselves and understand the endless variety and learn to respect the differences. So although differences can lead to discrimination, we can also take a look at how differences can lead to a celebration of diversity. Are there any other books that have helped you in teaching kids about diversity? Thank you thank you and more thank you..this is EXACTLY what a mother wants 🙂 though the kiddo is still young for most books, I am book marking this for the future…. Awesome picks Sandhya! Own or have read all, and agree that is a gem. One more: ‘Different Just Like Me’ by Lori Mitchell. Wonderful books, Sandhya, thanks for sharing! A couple more: ‘If The World Were Blind’ is interesting, and one of our favorites, ‘The Sneetches’ by Dr.Seuss. Thanks, ladies! Your encouragement means a lot to me. I should look up the books you have recommended, Namrata and Sheela !